I think I’m like most travelers. While traveling throughout the world, I develop a mental list of special places in different cities. For me, they are places so exciting they’re worth returning to whenever I’m within striking distance. During the dozen or so times I’ve returned to Mexico, I’ve developed my list of the best things to do in Mexico City. It’s a wonderful grouping of a half-dozen gems, all of which can be seen and enjoyed in 3 days or less. I’ve been introduced to some of these special places by friends and family. Others I sought out after reading about them. One I just stumbled upon while walking through the park. Now, even if I’m only passing through to somewhere else, I try to squeeze one or two of them into what is often a hectic schedule. Part of their charm is that they’re all entirely different. In the historic center, I enjoy the serenity of Alameda Park as well as the chaos of the city’s Zocalo. 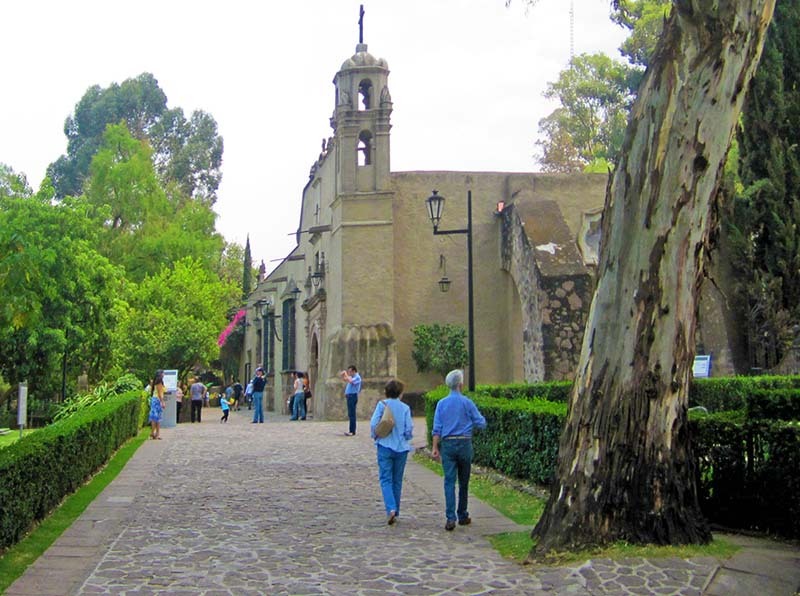 And for me, a stroll through the quiet, historic neighborhood of Colonia San Angel is as enjoyable as an afternoon listening to mariachis on the Crayola-colored boats of Xochimilco. If you have 2-3 days in Mexico City, I suggest you seek out these half-dozen places in the capital. The Alameda Central, known to many as just Alameda Park, is in the historic center of Mexico City. It is a beautiful park that has become one of the focal points of the city. Its name is derived from alamos, meaning poplar trees, which were planted here in the 16th century. The park is a serene place that’s often filled with vendors and local out for a stroll. There are many statues and monuments scattered throughout the park, but the most famous building in Alameda Park is the Palacio de Bellas Artes, a beautiful Art Nouveau building with an Art Deco interior. Pretty gardens surround it, and the interior has murals by great Mexican artists. When I was there last time, I enjoyed listening to an organ grinder performing near the front entrance. It made me feel I had stepped back into the Mexico of another century. I had been coming to Mexico City for many years but had never visited the National Museum of Anthropology in Chapultepec Park until my last visit. It bowled me over with its beautiful, and educational, exhibits of Mexico’s pre-Colombian cultures. It is a marvelous collection of artifacts from all over the country that you won’t see anywhere else. They range from a large statue of a rain deity to a funerary mask covered with jade, turquoise, and shell. It’s the most extensive collection of Aztec treasures anywhere. Don’t miss this place if you’re in Mexico City, and leave yourself at least half a day to wander through it. The Zocalo in Mexico City or the Plaza de la Constitución as it’s officially known, is the heart of Mexico City. 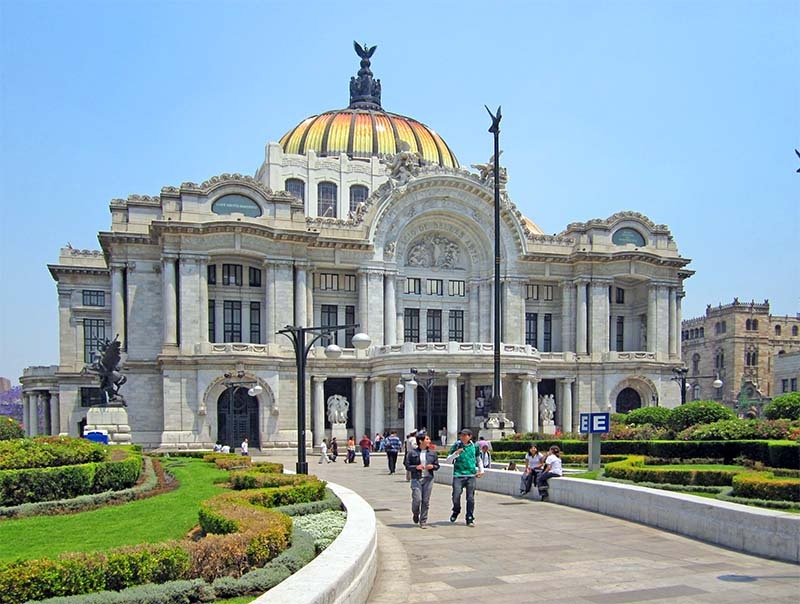 Visiting the plaza is one of the most popular things to do in Mexico City. The plaza is one of the largest public squares in the entire world. It’s also the site of two important religious buildings. 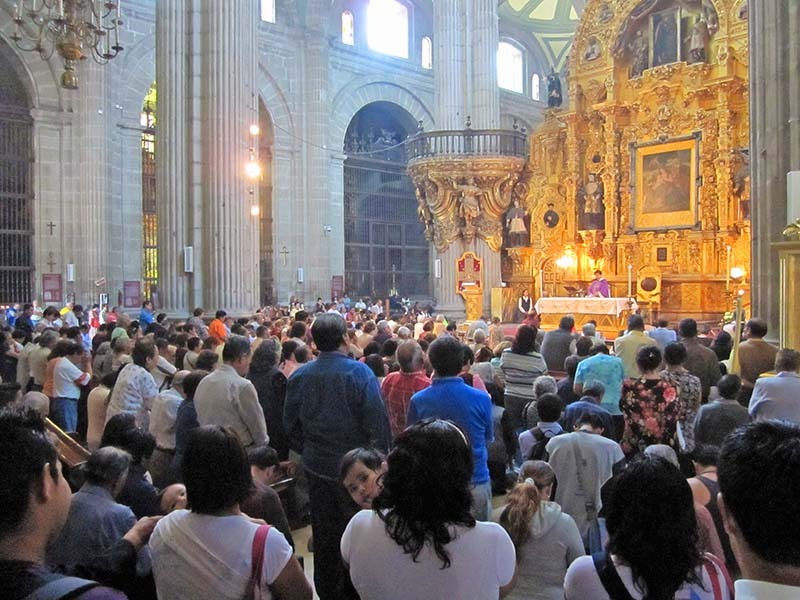 The first is the vast and architecturally diverse Metropolitan Cathedral, the largest church in Latin America. Its beautiful interior contains five altars and 16 chapels and took nearly three centuries to complete. The other is the Temple Mayor, the most important religious building of the ancient Aztecs. It was only discovered by accident beneath Mexico City’s Zocalo in 1978 and is still undergoing excavation. It has an interesting museum worth visiting. Around these magnificent Zocalo sites, however, is something nearing circus-like proportions. You can watch shamans performing their rituals on waiting women, and crowds of sidewalk vendors hawking just about everything imaginable. It’s a cacophony of sound and color, at times almost like being in the middle of a rainbow. San Angel initially was a Spanish colonial city but has now been swallowed up by the modern metropolis. Still, though, it retains its Spanish colonial feel in both its architecture and the layout of the neighborhood. It’s a great place to stroll on a quiet Sunday afternoon. 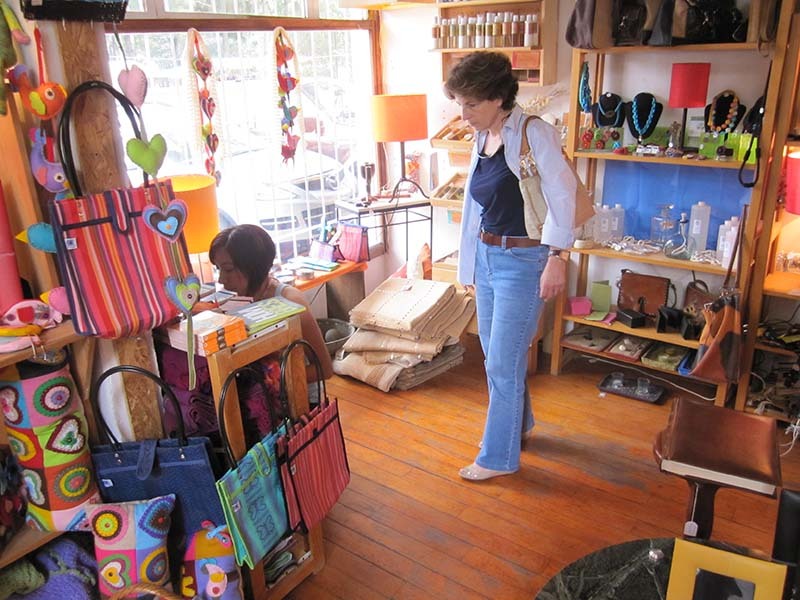 Stroll about tranquil San Angel, and you’ll discover many museums and art galleries. In good weather, you’ll also see artists displaying their works in the parks. San Angel also has been home to notables ranging from Leon Trotsky to Diego Rivera and Frida Kahlo. 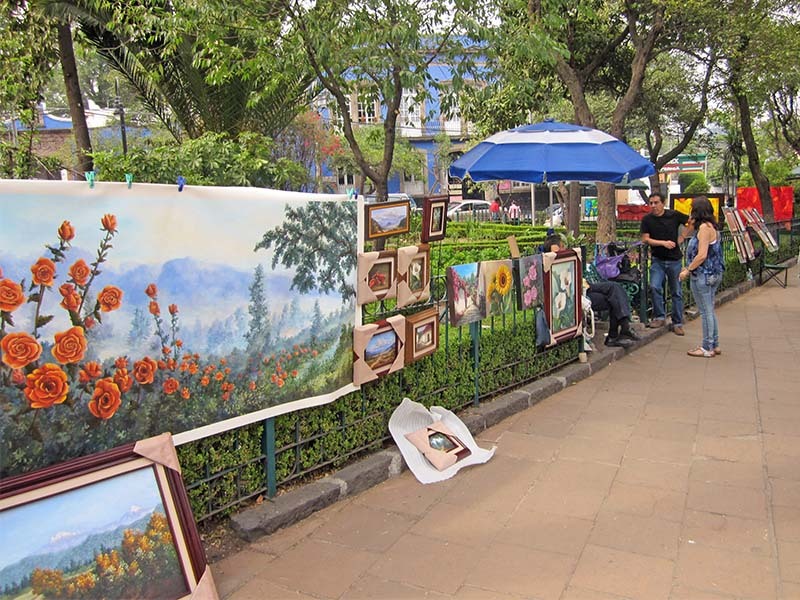 On my last visit to Mexico City my wife and I, along with a friend, spent an hour or two roaming about an art fair set up in a San Angel neighborhood park, before heading off to the San Angel Inn. A notable old restaurant, it’s still an excellent place to have a late Sunday lunch or early dinner. Out near the area of Xochimilco, the Dolores Olmedo Patino Museum houses the most extensive private collection of works by famed Mexican artist Diego Rivera. His works, as well as other beautiful exhibits, are housed in a picturesque 17th-century mansion. Making it even better though, is that the grounds outside the building are just as spectacular as the galleries inside. It’s one of those fantastic places where you walk through the front gate and can’t believe your eyes. Dark-green ivy and luscious bougainvillea cascade down high stone walls and peacocks stroll freely about the beautiful park-like grounds. Visiting it one weekend, we came across a few rows of chairs facing a small stage. We took a seat and listened to some great music played by a small group of musicians. Behind them, on the other side of a wrought-iron fence, a peacock slowly swayed to the beat. Located about one hour south of Mexico City, this UNESCO World Heritage Site provides an experience that is uniquely Mexican. The only remaining Lake remnant of Mexico’s old Aztec empire, Xochimilco still has the canals and semi-floating gardens built by the Aztecs centuries ago. When you arrive you rent a colorful little boat with an oarsman to punt you along through the canals. All the boats have tables and chairs and a canopy to protect you from the sun and rain. All along the way, other small boats drift by. Call them over, and you can buy flowers, food, and handicrafts, or enjoy a performance by a mariachi band. It’s great fun and, yes, it is exceptionally touristy. 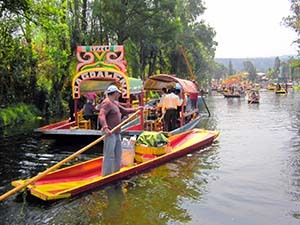 Nevertheless, Xochimilco remains a unique experience enjoyed by foreign tourists, as well as the Mexicans themselves. It would be great to visit Mexico City sometime. Xochimilco, with the canals and the boats looks really cool. Even though it is touristy I would want to rent one of the boats! 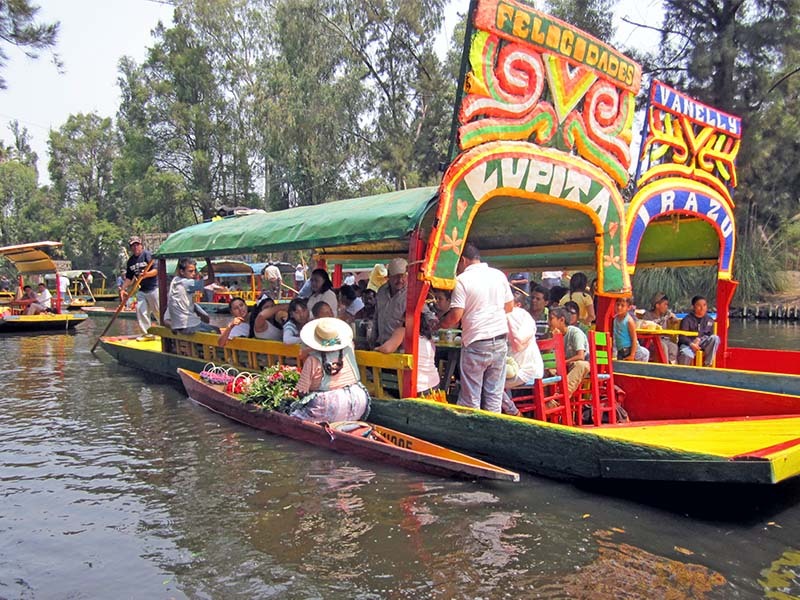 Xochimilco is one of the most colorful places you’ll ever see. It’s fascinating to watch the little boats that float all around you, on which people cook food, sell flowers, play music, etc. It’s like a little floating city. I have been to Mexico but I have never made it to the capital city! The National Museum of Anthropology sounds very interesting. 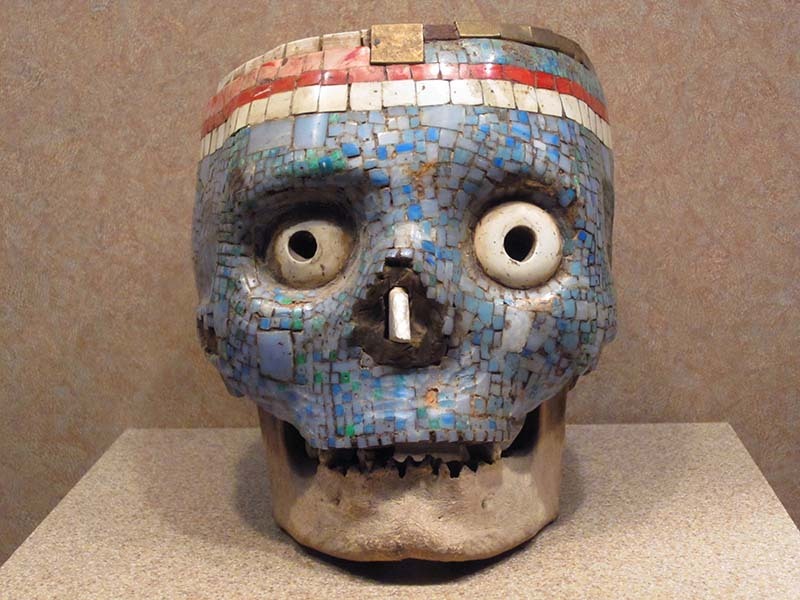 The funerary mask covered with jade, turquoise, and shell is impressive! I’m definitely taking a note of your post for my future visit to Mexico City! The Museum of Anthropology is the place I stumbled upon while walking through Chapultepec Park. Plan to spend at least a half day there. I always find new things to do or see when I visit Mexico. Its probably one of my favourite travel destinations. These activities will be bookmarked for my next Mexico vacation. If you want to make the most of a vacation in Mexico, you’ll find that Mexico City is the perfect place for numerous day trips. Hear all the time about the dark side of the capital of Mexico. So good to see such a beautiful side of a clearly colourful city. The boats really do look like a fun thing to do! It’s a very colorful city and quite unique. I’ve been to a few of the popular beach destinations in Mexico but would love to visit Mexico City and experience more of Mexican culture. Mexico City looks really interesting especially Xochimilco. If you want to experience more of the Mexican culture you must spend some time in Mexico City, the huge urban center of the country. It’s wonderful.